The natural order of things, at least how the Eastern Conference of the NBA was supposed to be, seemed to begin to adhere to the predicted natural laws Saturday as the Bulls dominated the Indiana Pacers 110-94 in a game in which Chicago led by at least 20 points for most of the game. And so less than three weeks into the 2013-14 season, Philadelphia and Boston and Orlando and all those “surprise” teams are fading away as the Pacers, Heat and Bulls are now the top three teams in the conference. And in what was hardly a statement game given the immaturity of the season, the Bulls affirmed their position in the basketball cosmos. Though these one of 82 things litter the NBA landscape, especially early, this was a burning landfill for the Pacers. The Bulls in going to 5-3 with their fourth straight win gave Indiana its first loss of the season after nine wins. But more so was how convincingly and one sided the game was. The Bulls led 60-35 at halftime and 82-49 late in the third quarter. Indiana led for one minute early in the first quarter and trailed by fewer than 10 points for only the first 10 minutes of the game. The Bulls scored a season high in points and the Pacers had more than 100 scored against them for the first time this season. The Bulls scored 19 more than any previous Pacers’ opponent, eight of whom now have losing records. The only team the Pacers defeated with a winning record was the Bulls, who were leading by two points with about seven minutes left in the fourth quarter of that game in Indianapolis. The Bulls did that with an exclamation as they also had season highs in three point shooting percentage (11 of 19) and makes and dominated Indiana pretty much all over the court, 46-34 in inside points, 42-37 on the boards, 25 assists on 40 baskets to 16 assists for Indiana. The Bulls also limited the Pacers to four of 16 on threes with Paul George held to three of 14 shooting overall and 12 points. 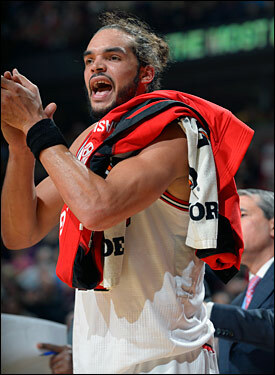 Roy Hibbert with a marvelous defensive effort from Joakim Noah picked up a pedestrian 14 points to lead the Pacers. Though these things are often laid to the vagaries of shots being made or missed, clearly the Bulls, particularly with Deng and Noah and then Taj Gibson off the bench with 15 points and eight rebounds, had a lot to do with that. And while no one will dismiss the Pacers, who are a very good team, they showed what many suspected, that they are a good team. No greatness there. Not that there’s greatness, frankly, in anyone but Miami yet. But the Bulls delivered the game plan to play the Pacers, who like the Bulls have one star offensive player who makes plays off the dribble. Even if George wasn’t one Saturday. The Bulls often are demeaned for this issue beyond Rose. But the Pacers match up similarly to the Bulls with front court size, rebounding strength and role players. They’ll have trouble scoring most of the time. The Bulls generally do as well, though they began to show something in these last two games, the wins in Toronto and against the Pacers, that is enhancing their offensive game. Rose, of course, making those shots from outside changes much. One reason they may have been playing softer on Rose was his 33 percent shooting and 25 percent on threes coming in. 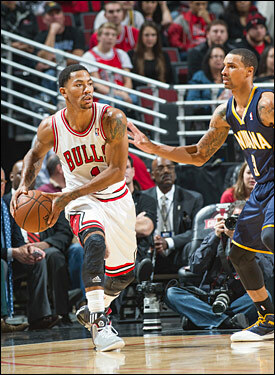 As he continues to make them and the defense tightens, it opens the drive much more for Rose. But the Bulls continued to find something that is promising for opening up their game and enhancing their often stagnant offense. It seemed coming out of Toronto Friday, Rose would not play Saturday. But Bulls coach Tom Thibodeau before the game said after extensive testing and workouts all day Saturday, Rose was ready to go. So after the strong start with Rose playing about seven minutes, Hinrich replaced him and the Bulls went from ahead four to leading 31-20 after one. Thibodeau a few minutes into the second quarter then paired Rose with Hinrich, further accelerating the pace as the two guards both pushed the ball out of the backcourt, passed ahead and ran screen rolls on each side that opened the court for the Bulls. 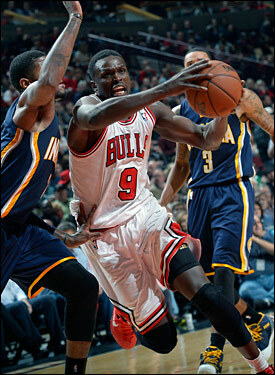 The Pacers had difficulty keeping up with the Bulls pace and scoring as a result. The Bulls often are faulted for having basically only Rose to create off the dribble, thus allowing defenses to load up on one side. But with Rose off the ball coming off screens and Hinrich making plays off screens as well, the Bulls offense functioned much crisper and provided more opportunities. It’s not a full time event as the Bulls play, of course, defense first and the wing combination of Deng with Jimmy Butler has been very good of late and helped get the Bulls off to such a good start by thwarting both George and Lance Stephenson. That offensive wrinkle was encouraging. But it was the Bulls bread and butter–OK, maybe their deep dish defense–that had that stick to the Pacers’ ribs effect. Noah had maybe the best four-point game you’ll ever see. He fouled out with seven rebounds and six assists. But his defense in the post against Hibbert, through whom the Pacers run their offense, was spectacular. Noah fronting and quartering Hibbert prevented numerous Pacers efforts to get the ball inside, forcing them to settle mostly on the perimeter. And Deng, likewise, overplayed and chased George relentlessly into by far his poorest game of the season after scoring at least 20 points in every game. You may remember it was George who basically told NBA.com after that Pacers win in Indianapolis that the Bulls winning times were with Michael Jordan and now it was the Pacers’ time. Asked about that Saturday, George predictably said it all was taken out of context. What taken out of context means from an athlete is George said it, but his coach basically called him a numbskull and told him to keep his mouth shut and maybe Larry Bird suggested he talk after he’s actually won something. The Bulls don’t bite much on stuff like that and when asked about bulletin board material, Rose laughed. There’s actually no more bulletin boards, but that’s besides the point. And it was as the Pacers, as the coaches like to say in the NBA, felt the Bulls. It was really about as good as it gets not only with overall team play for the Bulls, but against a top opponent considered a title contender. You don’t lead those teams by 33 often. But the Bulls owned the pace against Indiana from the start with a 15-5 lead to the first timeout as Boozer powered in, Rose slashed for a score and pulled up for a three and Deng ran out as Rose rebounded and threw ahead. That sort of pace has been missing from many Bulls games, but this was a serious, determined group from the start. Though Butler didn’t get much going from the perimeter, he again was harassing on defense and helping off with blocks and deflections, a vital part of the defense. His short haircut sees to have helped his aerodynamics. Likewise, Gibson continued to show strong post play in several times powering up between bruisers like Hibbert and David West. Initially, the Bulls were coming with a double on Hibbert when he put the ball on the floor as his court vision is poor once he makes his move. But Noah was so good they were able to stay with their assignment and defend the three, which had not been an early specialty. The Bulls poured it on to open the second quarter with Mike Dunleavy again finding his range with two more threes as he’s now 53 percent on the season. It was 60-35 at halftime and up to 82-49 when George fouled Butler making a three for a four-point play. The Pacers closed the quarter with a 10-2 run and opened the fourth with a pair of Chris Copeland threes, though still trailed by more than 20 until the last minutes of the game. United Center fans chanted, “overrated” at the Pacers. It was another streak buster for the Bulls after stopping Miami at 27 and the Knicks at 13 last season. Deng, Rose and Gibson all had season highs in points. And pretty much for no discernible reason, Boozer and Copeland were ejected with 21.9 seconds left for a little bit of pushing. The players are not particularly friendly. There’s no hugging or even much acknowledgement on the court after these games. Good. They are trying to win. “It feels good to beat them because they are a rival,” said Gibson. “Every time we’ve played them since I’ve been in a Bulls jersey it’s been tough. Every game between our rivals, the Heat, Indiana, it comes down to offensive rebounds, defensive rebounds, the hustle plays. It comes down to those early and late. Last time they dominated us on the boards in Indiana. We didn’t like that and came back and played a lot harder and executed well. This time it was the Pacers with the broken heart.